Food waste-to-energy plant proposed in N.J.
Building on its core organic waste collection business, a New Jersey company plans to construct a food waste-to-energy plant in Lakewood, N.J. The facility would convert about 60,000 tons of organic waste into 2 megawatts of electricity annually. State, local and tribal officials looking to implement clean energy projects and programs may be interested in the U.S. DOE Technical Assistance Program. TAP held a webinar May 12 to educate officials about the benefits of the program. The opening of a new pellet mill in Andover, Hampshire, means Verdo Renewables now has two operating pellet plants in the U.K., both producing about 55,000 metric tons (60,600 tons) of pellets annually for heating systems. Agricultural-waste-to-energy company Homeland Renewable Energy Inc. has developed a new emission control and water recycling system for implementation at its poultry litter-fueled biomass plants. The Southern Research Institute's Clean Energy Technology Development Center believes it has overcome one of the primary challenges related to biomass utilization in coal-fired Integrated Gasification Combined Cycle power plants. After substantial changes to its power purchase agreement (PPA), developers of Laidlaw Berlin BioPower LLC's 70-megawatt Berlin project in New Hampshire are hoping the project will still be viable. We Energies and Domtar's plan to build a 50-megawatt biomass cogeneration plant in Rothschild, Wis., has been approved by the state Public Service Commission. To move forward, however, the companies must lower the cost of the project by $10 million. The Westervelt Co. has chosen a 104-acre site near Aliceville, Ala., as the location for the first facility in its larger wood pellet production platform. 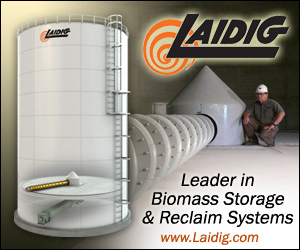 Initially, the pellet plant will produce about 250,000 metric tons of pellets. Citing numerous issues in the Boiler MACT and CISWI rules, the AF&PA is among 10 organizations representing a range of industries that submitted a petition on May 9 for administrative reconsideration and amendment of the Boiler MACT and CISWI rules. Following the launch of its Maximum Achievable Control Technology compliance tool myMACT.com, Dixon Environmental will hold a webinar, Understanding EPA's New Boiler GACT & MACT Rules, which will include a demonstration of the free online solution.